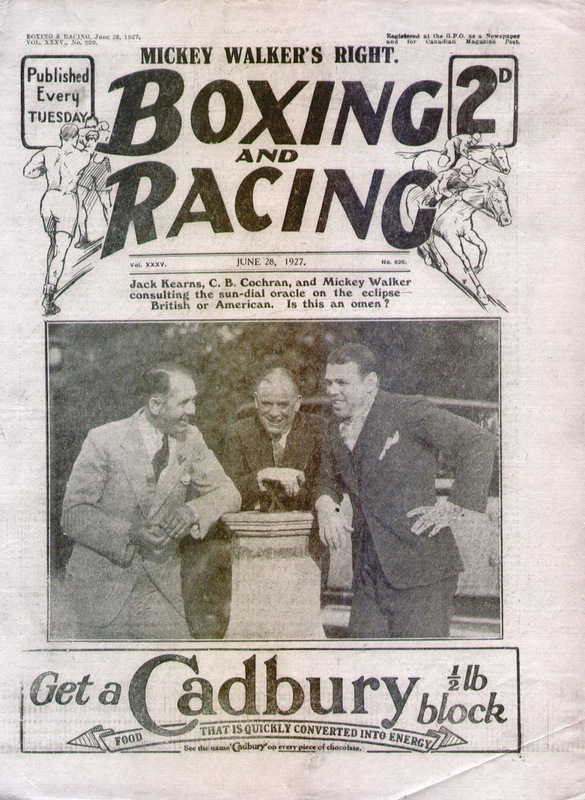 "When Mickey Walker was signed up to defend his world middleweight title against Scotsman Tommy Milligan at the Olympia on the above date the whole world of British boxing fans were agog with interest. Jack Kearns, Walker’s manager, struck camp at Taggs Island, which was situated in the middle of the Thames river at Hampton Court. Kearns, who was the former manager of Jack Dempsey, former heavyweight champion of the world, was very businesslike and arranged what order we would spar with his present champ. 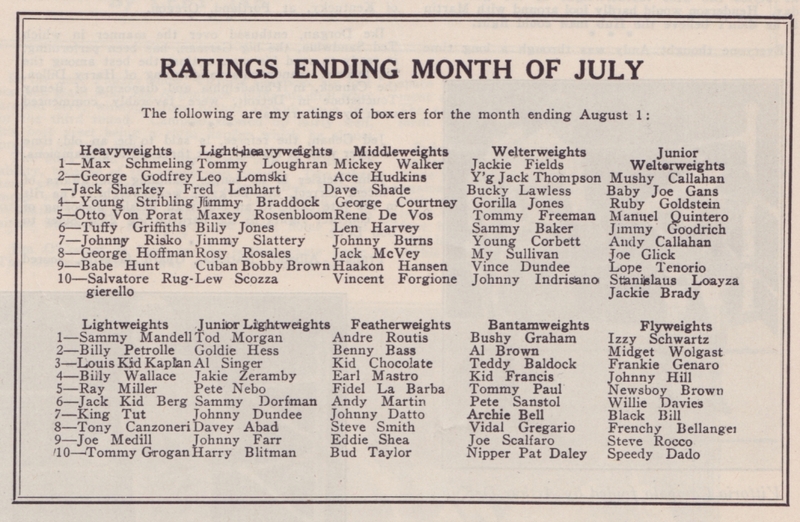 I sat at the ringside and watched Mickey spar two rounds each with a Malcolm Campbell, middleweight champion of Scotland and Tom Fowler, a heavyweight who had served his time as a sparring partner to most of our leading heavies. Walker, not a brilliantly clever boxer but clever just the same, with a K.O. punch in either hand, and I was his sparring partner. One of his punches could kill me. Still, I had a job to do and I intended to do it as well as I could. 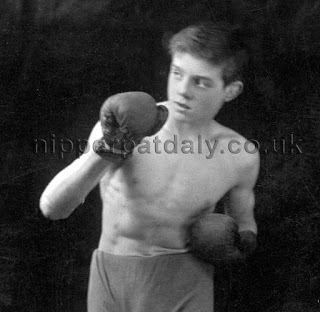 After I had finished my training I was told that we had been booked to appear at Jimmy Butler’s boxing booth at the Welsh Harp, Hendon in the evening and that I was to stand on the front of the booth and take on all comers. I did two houses, which means I had two fights, three rounds each. Still, it brought my manager in a few shillings and saved me wasting time. I only fought two fights as there was not time for any more, as it was 10pm and the fair was closing down. Still, the time saved me from having several more bouts. I’d had an easy day, only having sparred with the world middleweight champion and fought two opponents at a booth. I was very proud at having sparred with the world’s middleweight champion and also pleased that Mickey had pulled his punches." 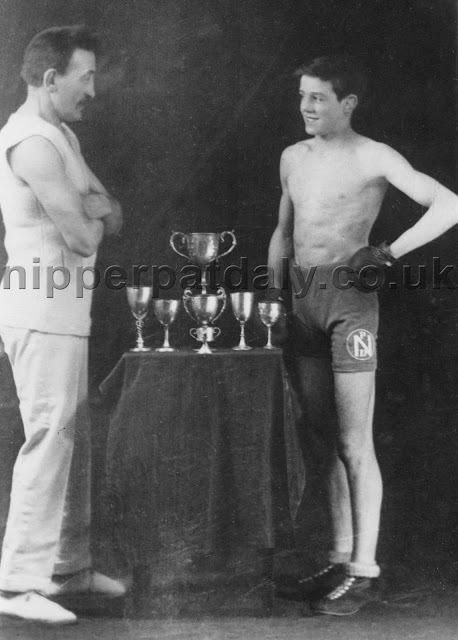 This extract from Nipper Pat Daly’s memoirs is from the critically acclaimed 2011 biography ‘Nipper: The Amazing Story of Boxing’s Wonderboy’. For more information or to buy the book visit www.nipperpatdaly.co.uk. In 1929, aged just 16, Nipper Pat Daly appears alongside Walker in 'The Ring' magazine's top-10 world ratings.